Looking for some sweet handouts for your next corporate event, giveaway basket or your employees' personal use? Document holders are the way to go. 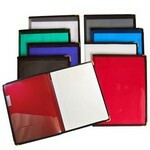 Our promotional document holders are useful, well-made and affordable. All you need to do is choose which one fits your own personal style. 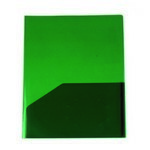 At Promotion Pros, we take pride in offering tons of choices to our customers, and our logo document holders are no exception. Our Twin Pocket Presentation Folder has a thick satin finish and twin pockets, with a business card holder. Our simulated leather conference padholder features an interior organizer with one slant pocket, two business card holder slots and makes a great corporate gift item. This simulated leather protech padholder has an interior pocket, wide-body pen holder and is ideal for employees and business expos. This Twin Pocket Presentation Folder is a tear resistant poly folder with Business Card Slits on the inside left pocket. The Notepad Holder File Binder consists of a full writing pad, five pocket files, a CD holder and twin business card holders. This Large Padfolio w/ Document Sleeve contains a ruled note pad, an inside document storage sleeve, a business card slot, and a pen loop. 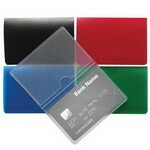 This Credit Card Case can be used to hold Credit Cards, Business Cards, Medical Cards, Insurance Cards and more.